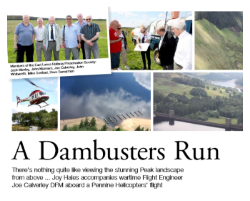 As featured in Derbyshire Life magazine, find out what a genuine 617 Dambuster squadron member said about our pleasure flight! You will fly at around 1500 feet, taking in some of the most picturesque scenery the Peak District has to offer, the helicopter then overflys Ladybower Dam, Howden Dam, and the twin towers of Derwent Dam. The Dambusters pleasure flight is available on several weekends throughout the year. To find out when the next available scheduled flight is, and where we are flying from, please see the below table. A thoroughly enjoyable pleasure flight around the High Peak / Dark Peak area of Derbyshire which lasts approximately 20 or 30 minutes depending on your chosen flight. On a 30 minute / 45 mile Dambusters Run from The Moorlands, Owler Bar, Sheffield, passengers also view Chatsworth House, one of the UK’s most spectacular stately homes with magnificent grounds. 20 and 30 minute flights from Windy Harbour and 30 minute flights from the Huntsman also overfly the wreckage of the “Flying Fortress” an American WWII Boeing B29 bomber that crashed on the moorland of Bleaklow in 1948.